This blog is a place to share, learn and sometimes laugh about ground squirrels and prairie dogs. My days are spent talking about ground squirrels, prairie dogs, and other burrowing rodents. I am also a Speaker at Seminars throughout California, educating people on IPM and organic methods of controlling their populations. Ground squirrel holes! They can destroy beautiful landscaping and make athletic fields and pastures hazardous. 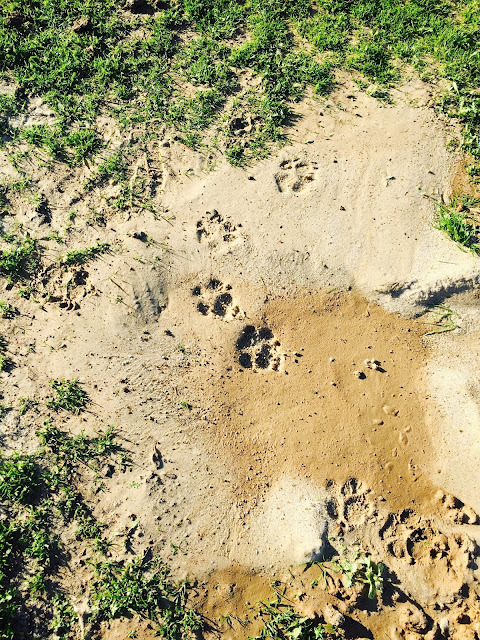 Ground squirrel holes are much more than an unsightly nuisance, they can cause serious injuries. How do you get rid of ground squirrel holes? Often people grab a shovel and start pushing the dirt surrounding the hole back in. That's usually not enough dirt on the outside, so they get more dirt and keep shoveling it in until it looks full. Surprise! The next day the hole is back. After trying dirt, rocks are often the next choice. Again, the next day, the hole is often back. Why doesn't filling in ground squirrel holes using a shovel work? Shoveling in the holes is often unsuccessful, because the ground squirrel is hiding in a lower portion of the tunnel system and they dig their way out. What is the best way to fill ground squirrel holes? 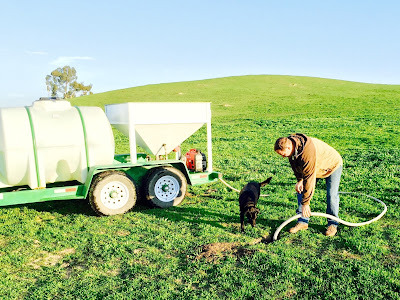 The Burrow Blocker machine is a fast, easy, and effective way of filling in ground squirrel holes.The patented machine pumps a slurry of sand and water into the hole. The water is absorbed into the soil and all that remains is the sand. The burrows and tunnels are completely filled from the bottom up. Mike & Pepper using the Burrow Blocker machine to fill a ground squirrel hole. The slurry looks like dirty water. See the handful of sand? The water is absorbed into the soil and all that is left is the sand. This filled hole has Pepper's paw of approval! Getting rid of ground squirrel holes is a form of habitat modification. By completing filling the hole, the ground squirrel's home along with its stored food and bedding is gone. Call (925) 634-9204 or email me if you have any questions on how to get rid ground squirrels and their holes using green solutions. Is it a Ground Squirrel or a Gopher? Do you know the difference between a Ground Squirrel and a Gopher? If you are battling burrowing rodents on your property, after awhile you might just start channeling Carl Spackler, Bill Murray's character in the movie, Caddyshack. Remember when Sandy McFiddish, the head groundskeeper of the golf course told Carl, in his rich Scottish accent, "Carl, I want you to kill all the golfers on the golf course."? Carl replied, " Correct me if I'm wrong Sandy, but if I kill all the golfers they'll lock me up and throw away the key." Sandy yelled, " Not golfers, you great fool! Gophers, rodents! THE LITTLE BROWN, FURRY THINGS!" Are ground squirrels making you a little nutty? What crazy methods have you tried to control them? Wrigley's Gum - I'm not sure why it had to be Wrigley's gum but we heard it worked, so we tried it. First we put the sticks of gum in the holes and a few weeks later, when the ground squirrels were as plentiful as ever, we thought maybe we should have chewed it first. We had lots of holes and lots of gum and our jaws got tired pretty quickly. All we ended up with was fresh breath and gum stuck to our shoes...and still too many ground squirrels. Hi! I am Lisa, the voice behind the Burrow Blocker. I'm living the life I love with my family and friends - some are furry or feathered. At our ranch, we created the Burrow Blocker. It is an amazing green machine, that controls ground squirrel and prairie dog populations.